The Osmond Brothers have been entertaining us for over 50 years and their anniversary tour a couple of years ago was almost a complete sell out. However, good things must eventually come to an end and they are undertaking their final UK tour. But it’s their biggest ever. 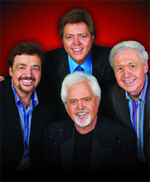 Thanks to their appearances on The Andy Williams Show on TV, The Osmonds became world-wide stars and when they started to release records and tour the reaction was so powerful that ‘Osmondmania’ broke out around the world, with scenes reminiscent of ‘Beatlemania’ from the previous decade. Their hit catalogue is pretty impressive, with One Bad Apple, Let Me In, Crazy Horses and Love Me For A Reason being the pick. Not only that, but it wasn’t long before members of the family went solo and for a time the charts included hits by The Osmonds, Donny Osmond, Marie Osmond, Donny & Marie Osmond and Little Jimmy Osmond. They have sold over 100 million records and garnered 59 gold and platinum discs. Jimmy was never a part of the group back in the Seventies. He arrived on the scene in 1972 with Long Haired Lover From Liverpool. But 20 years ago he decided to join them on tour. “Since the Seventies, the UK has been amazing, not just to me but to all my brothers, too. After a trio of Top 20 hits, Jimmy seemed to disappear from the scene and got involved with other things. When he had the hit with Long Haired Lover From Liverpool, he was reported as not knowing where Liverpool was – but that was soon put right. And despite the fact he celebrates his 48th birthday on April 16 (a rare day off on the tour), he still has to sing the hit he had before he was ten years old. * The Osmonds Final UK Tour – Up Close & Personal will be coming to Symphony Hall, Birmingham (0121 780 3333) on Thursday March 29 and The Civic Hall, Wolverhampton (0870 320 7000) on Wednesday April 11.